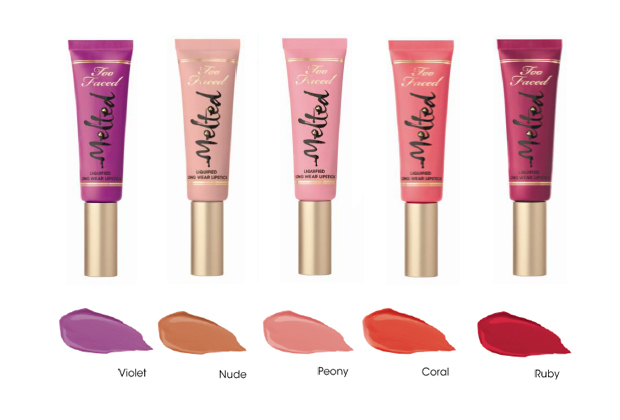 NEW Makeup Revolution Lip Lava Lipsticks – Too Faced Melted DUPE! Nothing excites me more than receiving an unexpected parcel, especially when it’s from one of my favourite brands. 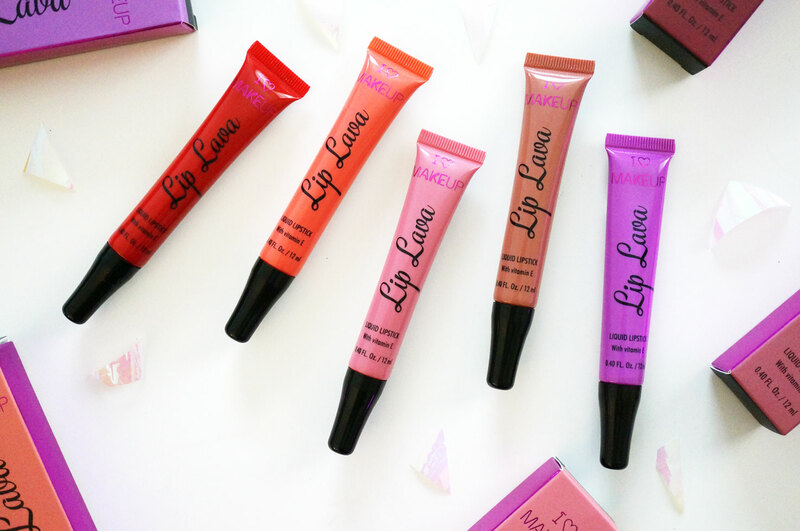 Makeup Revolution have just sent over their latest lip products – the full collection of five I Heart Makeup Lip Lavas! 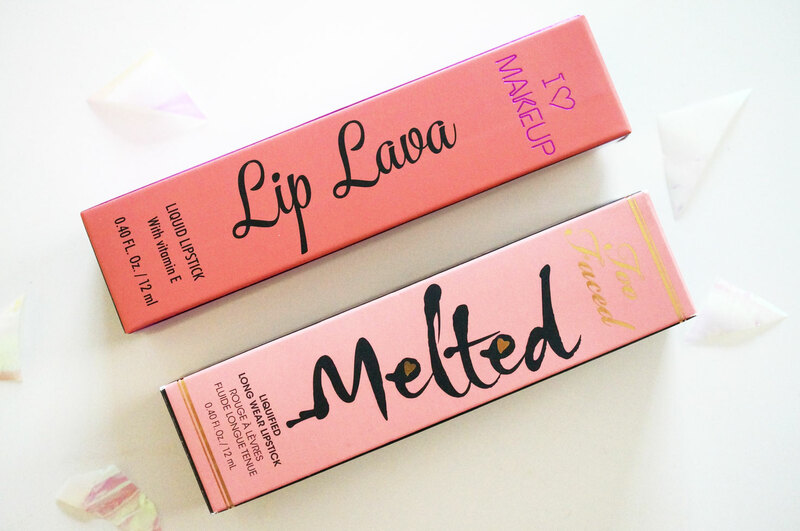 I have to say, the packaging instantly made me think of Too Faced’s Melted Lipsticks – and if you know me you’ll know these are one of my favourite lipsticks, so I couldn’t wait to get stuck in and try the Lip Lavas out! Ok so let’s take a look at the packaging first. 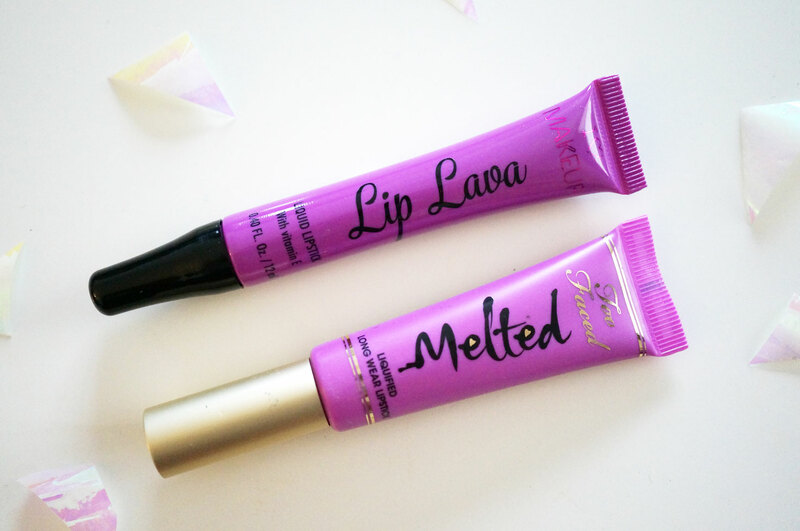 You can see there’s no mistaking the similarity between these and Too Faced’s Melted Lipsticks. The boxes really are similar in colour, style and text format. The tubes are not quite so similar though. Both come in a squeezy type tube and have 12ml of product, with a soft slanted sponge applicator, but that’s where the similarities end. Too Faced Definitely wins on appearance here, but I should also point out that whereas Too Faced’s Melted Lipsticks are £19 each, Makeup Revolution’s Lip Lavas are only £2.99! L-R – Shockwave, Forgiven, Tremor, Unleash, and Firestorm. The collection contains five shades in gorgeous bright and vibrant colours. The Lip Lavas are described as an Intense lipstick formula, melted to create our most impactful gloss. Smooth and comfortable wear, with long lasting formula with Vitamin E.
I think it’s important to mention at this point that these products are not glosses. They do apply like a gloss, and at first have a shiny, lip gloss like finish, but after a while this dulls down to a beautiful satiny finish, they feel smooth and creamy to wear, and are super long lasting too. They’re not quite as matte feeling as the Melted Lipsticks, but I don’t see this as a bad thing at all, especially if your lips tend to be on the dry side as mine are. Here’s my first comparison – MUR Shockwave at the top and TF Melted Violet at the bottom, and I’m not sure what’s happened to my TF Melted Violet, but it’s gone really watery! I haven’t used it for a while so I tried shaking it and squirting a load out, but it was still the same. To get a better idea of what it normally looks like take a look here. 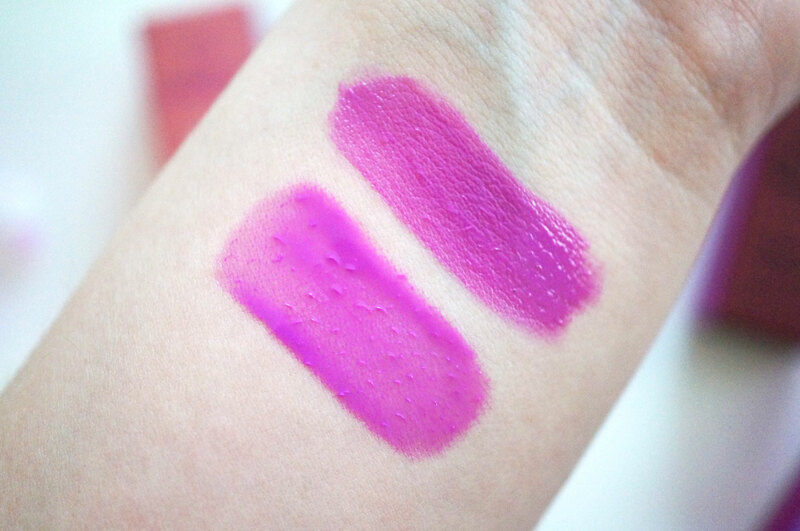 The shade is pretty much spot on identical, and the formula is just just the same as my Melted Violet was before it went runny – so Shockwave looks like it’s going to be the perfect replacement. 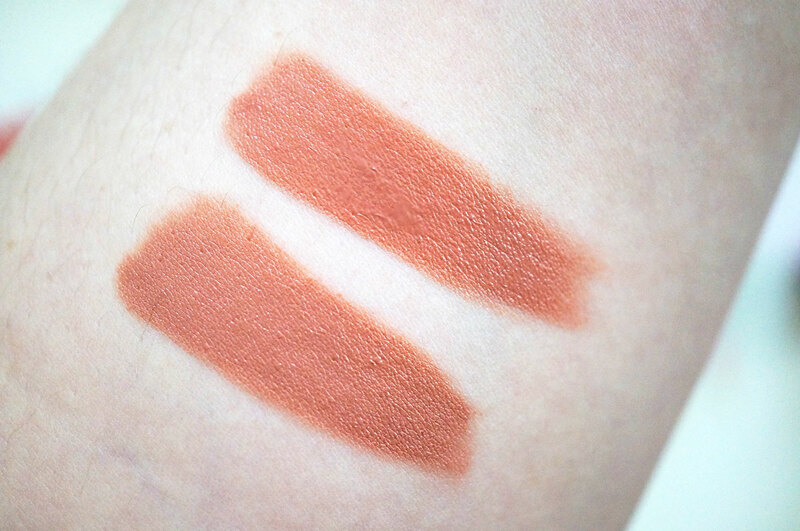 The only two little niggles I have about the Lip Lavas are the fact that the tube doesn’t look too pleasing to the eye (in my opinion) and also the product names aren’t printed on the tubes, only the boxes. These really are insignificant issues though, as these are definitely my favourite Makeup Revolution products so far! 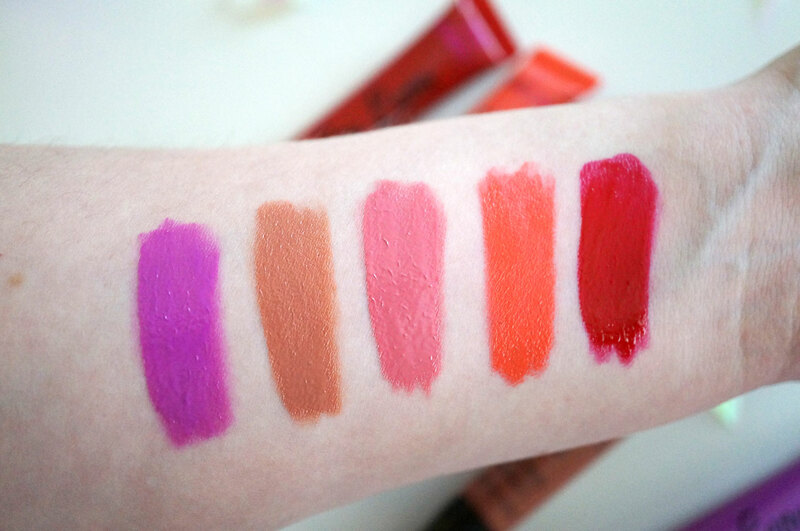 I’m SO impressed with them, and if you’ve been wanting to try Too Faced’s Melted Lipsticks, I suggest you snap these up straight away – you can get the full set of 5 Lip Lavas for under £12, which is far less that ONE Melted Lipstick! I love a new lipstick and these ones seem such a bargain don’t they. Those are such good prices. Like the idea of putting them on like a lip gloss. Great review.